In April, APA will head to San Francisco for the 2019 National Planning Conference. 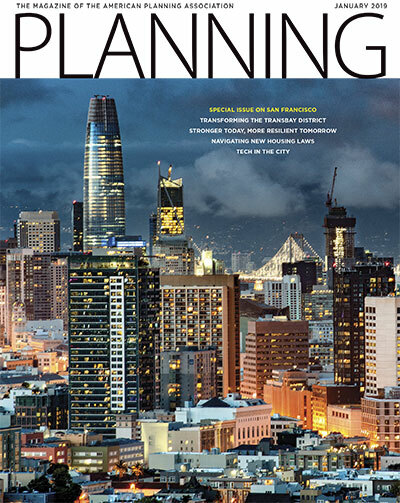 This month, APA’s signature magazine prepares the way by spotlighting planning achievements in the city and Bay Area. Read the January issue of Planning to catch up on local progress toward climate and hazard resiliency, downtown development, and supporting innovation while protecting the public interest. Seven years after its approval, San Francisco's Transbay district plan is close to reality. Story by John King, photos by Sergio Ruiz. James A. Castañeda tracks the changes he's seen from the window of a Caltrain car during 13 years of commuting. New affordable housing rules mean planners need to take an objective approach to zoning regulations. By Barbara E. Kautz, Dolores Bastian Dalton, and Eric S. Phillips. At both the state and local level, California is leading the way in climate and hazard adaptation, Michele Rodriguez reports. The Bay Area is learning to strike a balance between fostering innovations and protecting public interest, Juell Stewart reports. Web-only article: Naphtali Knox tells the surprising story of how America's first inclusionary housing came to be built in Silicon Valley. A guest column by APA President Kurt Christiansen. APA member projects, NPC19 registration, Great Places in America: People's Choice. Which planning issue are you most likely to advocate for in 2019? More on PUDs, deck parks, and the LA River. Addressing the opioid epidemic, 2018 election recap, earthquake-proofing San Francisco's waterfront. Promoting diverse housing options via zoning codes. Walkable cities, segregation, post-Katrina development in New Orleans. Blindspotting, more planning podcasts, help with visualizing data. Working toward better coalition building.